The use of Continuous Positive Airway Pressure – CPAP is the most successful treatment for Obstructive Sleep Apnea. 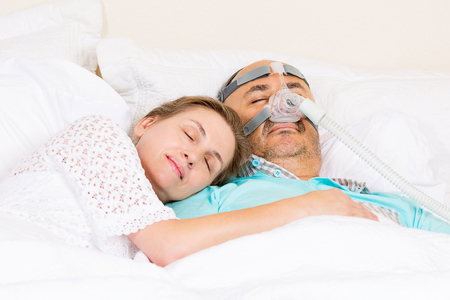 For many patients use of CPAP has been a life changing experience – giving them back their energy, reducing blood pressure, and reintroducing them to their bed-partner. Some patients find the idea of CPAP difficult – but Grove’s Clinical Specialists are highly trained professionals that are dedicated to providing patients with a successful transition to CPAP therapy. Effective treatment can reverse the effects of daytime sleepiness, fatigue, moodiness and depression. Studies have also shown that when patients are successful with their therapy, their long-term health care costs are at least 50% lower overall. There are also a variety of serious comorbidities such as cardiovascular disease, diabetes and stroke that have a strong connection to sleep apnea. Adhering to your recommended CPAP therapy produces the best outcomes for patients and better insurance reimbursement. Grove Medical is committed to helping patients stay compliant for their health and well-being. That is why every CPAP machine we sell has either a built in or snap-on modem to send data using cloud-based technology. Grove Medical and the patient’s doctor can access and review detailed data to determine how well the machine and therapy are performing. The patient can also access a summary of the reports. Newest generation models enable two way communication whereby Grove Medical and the physician can make modifications to the machine to reflect changes in the prescribed therapy. Patients can download smart phone apps from manufacturers to view and track their own data. Keeping your supplies fresh is vital to ensure the efficacy of CPAP. We offer patients a customized supply management program to align supply re-orders with each patient’s specific needs and individual insurance company guidelines. Patients have 24/7 access to a personal web portal with reminders to re-order hoses, chin straps, filters, tubes and more. While the patient portal is the most efficient and timely approach, patients may opt to receive an automated call or a call from one of our staff members. Patients receive an email one month after their appointment with a link and instructions to set up their patient web portal. After you have set up your patient portal you can over our secure network.